Texas-licensed Speech-Language Pathologists (SLPs) must complete all continuing education requirements prior to the expiration of their license to renew and maintain continuous licensure. A continuing education unit is the basic unit of measurement used to credit individuals with continuing education activities for licensure. One continuing education units is defined as 10 clock hours of participation in an approved continuing education experience. Texas SLPs are required to obtain 20 clock hours of continuing education (2 continuing education units), with 2 clock hours (0.2 continuing education units) in ethics. Professional Development Resources is approved by the Continuing Education Board of the American Speech-Language-Hearing Association (ASHA Provider #AAUM) to provide continuing education activities in speech-language pathology and audiology. Over 20 courses are available @pdresources.org. 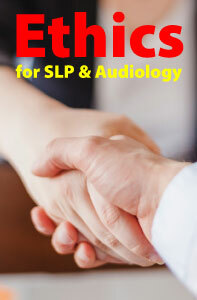 Speech-language pathologists (SLPs) encounter ethical issues across the spectrum of practice settings, from pediatric treatment in schools or clinics to care of elders in skilled nursing facilities. Every decision the SLP makes should be made with the code of ethics in mind. 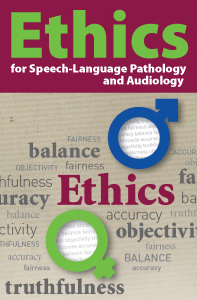 Several state licensing boards now require that licensed speech-language pathologists and audiologists complete a course on ethics as part of their continuing education (CE) requirement for renewal (i.e. Ohio, Texas, DC, Kentucky, Wisconsin, etc.). Ethical decision-making is based on awareness, intent, judgment, and behavior. Then a judgment must be made with the intent to make the ethically correct decision, and action taken. 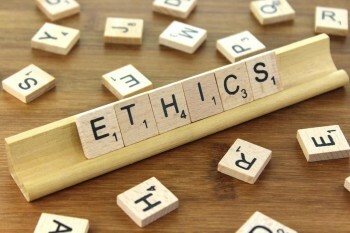 Ethics is about deliberate decisions made to benefit the people involved or to have the least harmful repercussions if a positive outcome is not possible. Mrs. Stuttgart has brought in her husband for an evaluation by the speech-language pathologist. 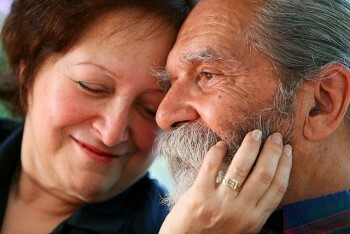 Mrs. Stuttgart is concerned that her husband is in the early stages of dementia. He does not seem connected to what is going on around him, she says, and makes strange replies when she speaks to him. Assessment reveals that Mr. Stuttgart has a severe hearing loss. The speech-language pathologist refers the couple to an audiologist, but Mrs. Stuttgart declines. “He always said he didn’t want to spend money on hearing aids. He hates them. I know he won’t wear them even if we buy them.” In light of the potential for safety concerns, depression and the adverse cognitive effects due to auditory deprivation, what is the ethical thing for the speech-language pathologist to do? What obstacles need to be overcome? Gather data. This includes regulations, laws, professional practice guidelines, and one’s professional ethics code. Decide if the problem is a regulatory one. Compare the issue to the code of ethics; is there a standard that can help in decision-making? Identify the person(s) who have power (and thus control) in the situation. Identify what is and is not in your control. Identify people who can be resources for more information or brainstorming. List potential actions with their positive and negative consequences. Take action, and then evaluate the plan. Are next steps needed? Professional Development Resources is approved by the Continuing Education Board of the American Speech-Language-Hearing Association (ASHA Provider #AAUM) to provide continuing education activities in speech-language pathology and audiology. See course page for number of ASHA CEUs, instructional level and content area. ASHA CE provider approval does not imply endorsement of course content, specific products or clinical procedures. CEUs are awarded by the ASHA CE Registry upon receipt of the CEU Participant Form from the ASHA Approved CE Provider. Please note that the completion date that appears on ASHA transcripts is the last day of the quarter, regardless of when the course was completed. Professional Development Resources is also approved by the Florida Board of Speech-Language Pathology and Audiology (Provider #50-1635) and the Ohio Board of Speech-Language Pathology and Audiology and is CE Broker compliant (all courses are reported within 1 week of completion). When you create an account, you will be asked if you want your credits reported to ASHA. If you do, check yes and enter your 8-digit ASHA number. All course completions will be submitted quarterly. If you already have an account, click the My Professions tab on your account dashboard. Then click the profession listed. A box will open (pictured below) where you can edit your state license information as well as your ASHA reporting options. If you check no to reporting, we will NOT submit any completions to ASHA – and we cannot report after the fact (ASHA does not allow us to submit outside of the established reporting cycles). Ohio-licensed speech-language pathologists (SLPs) are required to earn 20 hours of continuing education (CE) every 2 years to renew. The current license renewal deadline is December 31, 2016. Ten continuing education hours must be specific to clinical practice in the area of licensure. Ten continuing education hours may be acquired in areas related to speech language pathology or audiology or both. The area of licensure is speech-language pathology or audiology as indicated by the license. Related areas are topics not specific to the area of licensure but would enhance the practice of the licensee. Effective January 1, 2015, licensed speech-language pathologists and audiologists must complete 20 clock hours of continuing education with at least two clock hours related to ethics. Notes: 10 hours must be in area of licensure, 10 may be related. 2 hours must be related to ethics (effective 1/1/15). 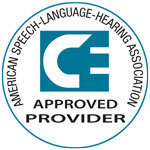 Professional Development Resources is approved by the Continuing Education Board of the American Speech-Language-Hearing Association (ASHA Provider #AAUM) and the Ohio Board of Speech-Language Pathology and Audiology and is CE Broker compliant (all courses are reported within 1 week of completion). Click here to view more courses available. This course is offered for .2 ASHA CEUs (Introductory level, Related area). ASHA credit expires 2/21/2018. ASHA CEUs are awarded by the ASHA CE Registry upon receipt of the quarterly completion report from the ASHA Approved CE Provider. Please note that the date that appears on ASHA transcripts is the last day of the quarter in which the course was completed. Professional Development Resources is also approved by the Florida Board of Speech-Language Pathology and Audiology and is CE Broker compliant (courses are reported within one week of completion).